Bellagio Village tapestry shows a scene of this Lake Como village steps leading to the water. Accompanied with gorgeous flower filled terrace windows on the villas and shops, and a lovely cobblestoned street, one can imagine walking through the Bellagio Village to the water of Lake Como. As an inspirational region for artists and poets for centuries, as well as the playground of aristocrats, the region of Lake Como of Italy has been an idyllic escape of wonderful landscapes and cityscape scenes. This lovely scene shows this region most beautifully. 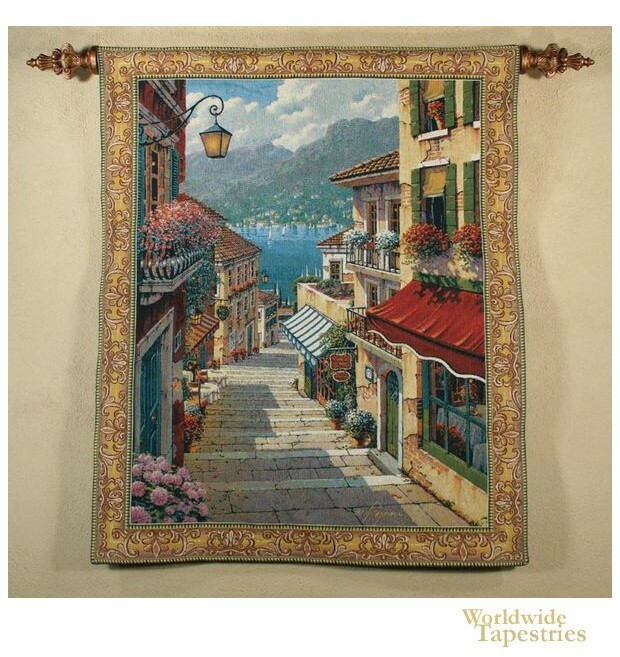 This Belgian tapestry "Bellagio Village" is backed with a lining and has a tunnel for easy hanging. Note: tapestry rod and tassels, where pictured, are not included in the price. Dimensions: W 51" x H 64"
Dimensions: W 65" x H 85"